Erector Brewing Collective and Nolo team up. Ariel Shearer Photos. Lamb ribs cooked in duck fat and served over a puree of celery root and pear. Thin crust pizza topped with broccoli rabe and provolone. 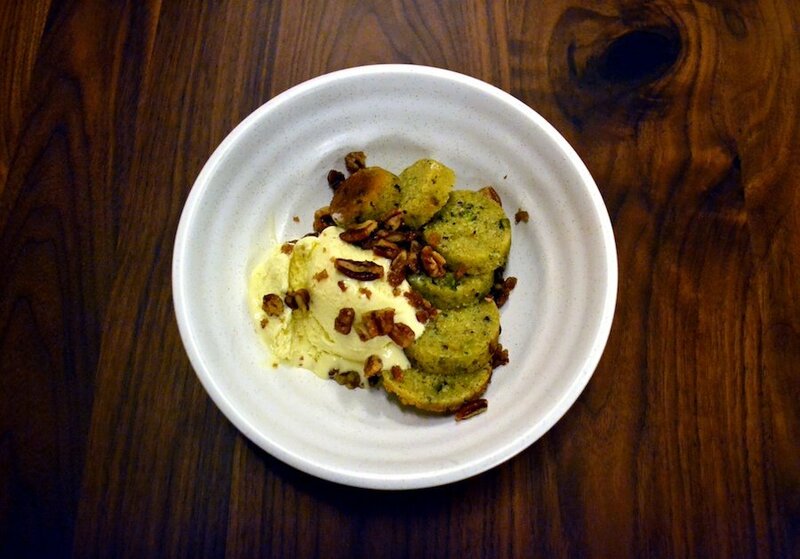 House-made honey ice cream served with rose and cardamom semolina flour cakes. These are just a few flavor combinations Daniel Parillo and Derek Bacon are trying out at Nolo, a new restaurant and micro-brewery in the former Jet Cleaners building on State Street. 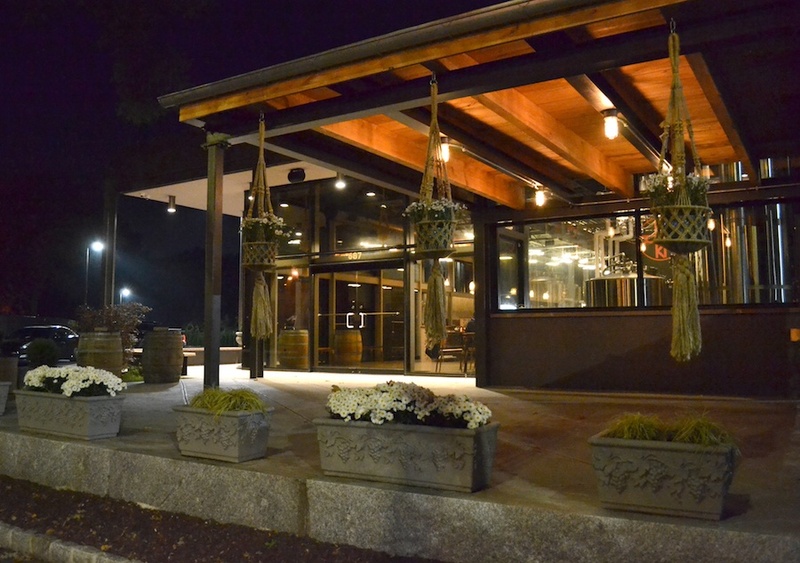 While the two are focusing their attention on all things wood-fired, the brewery is operated by Erector Brewing Collective, a small-batch brewery that started in Erector Square three years ago. After soft opening for family and friends last week, the restaurant is set to open to the public later this month with a finalized menu. 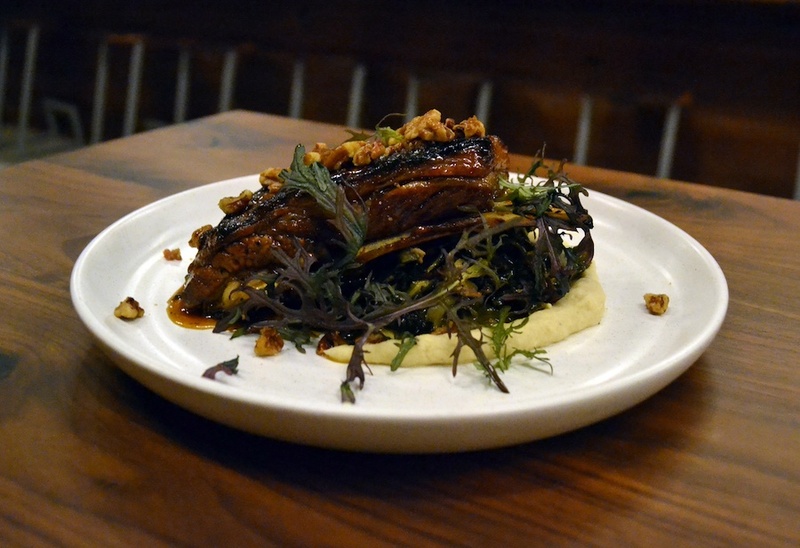 Big plate: Burnt honey lamb ribs with collard greens, celery root pear puree, and spiced pecans. The idea for Nolo was born two years ago, as Bacon and Parillo discussed expanding both their physical and culinary footprints in the city. The two are co-owners of Da Legna, a New Haven-style pizza restaurant on State Street that they opened in 2012 and have since expanded with vegan and gluten-free pies and a large menu to work around dietary restrictions. They said that they have no intention of leaving Da Legna as the new venture lifts off the ground. 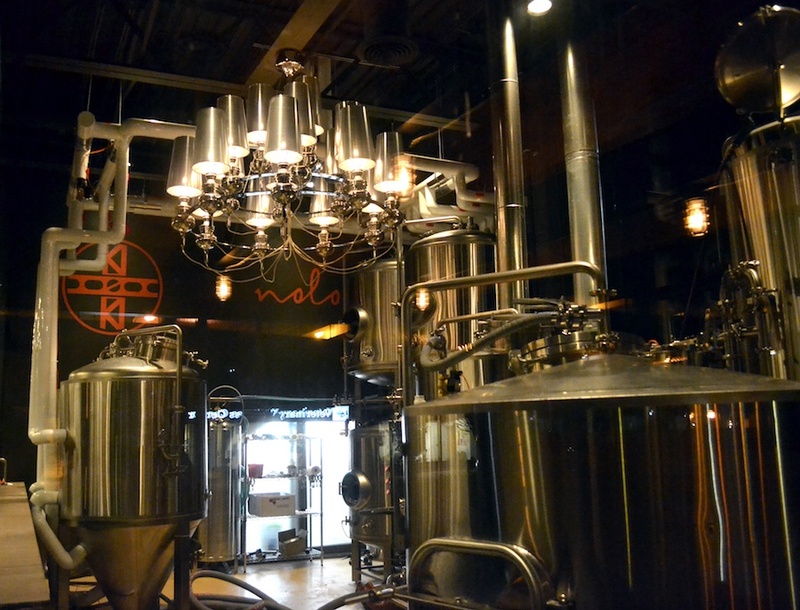 The bar at Nolo, where Erector Brewing controls the taps. Nolo's atmosphere is a jump from Da Legna’s, trading exposed brick walls and bare bulbs for mauve crushed-velvet booths and lightning-bolt lights. Picture moulding and a massive silver chandelier suspended in the Erector brew house add hints of more classical flair to the otherwise modern space. 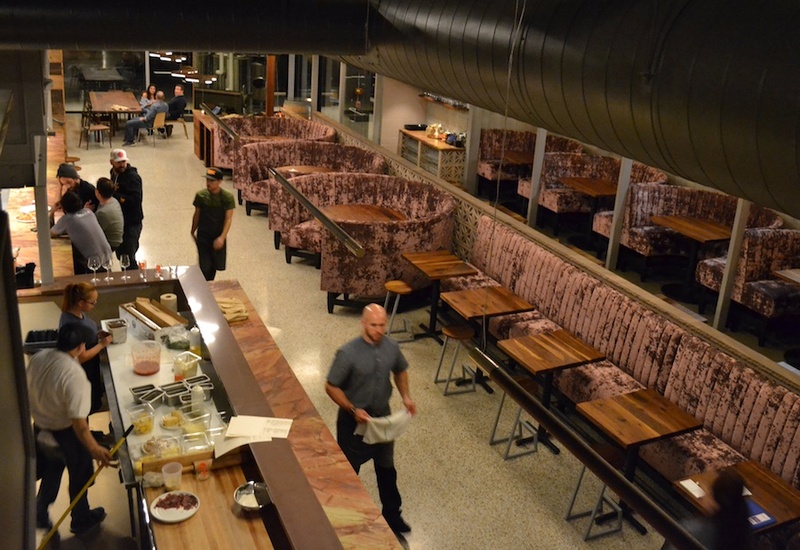 There’s an open kitchen and seating for 140, plus a patio with room for more, and a loft area above the bar with private booths. While varied, dishes on the menu share a unifying theme: heat. From a small plate of Sicilian olives blackened on the wood-fire grill to an ice cream dessert topped with candied pecans kicked up by cayenne, Nolo’s menu plays with fire in all forms. “Calabrian chili is our spice,” added Executive Chef Josh Ulmer. Honey ice cream with rose and cardamom semolina flour cakes. The heat of the classic Italian hot pepper appears across the menu, which ranges from small plates ($7-17), to pasta dishes ($18-22), big plates ($22-36) and pizzas ($19-26). “We wanted to be able to cover as much ground as possible and we felt that bringing Josh on would really enhance the kitchen side of things, as opposed to us staying in a more rustic Italian area of cuisine, with Josh bringing a more modern technique,” Bacon said. The menu offers new takes on Italian classics such as the wild boar ragù ($20), and occasionally borders on fusion, as with the Italian ramen ($22, and it is a generous interpretation of a dish once intended for the working class). 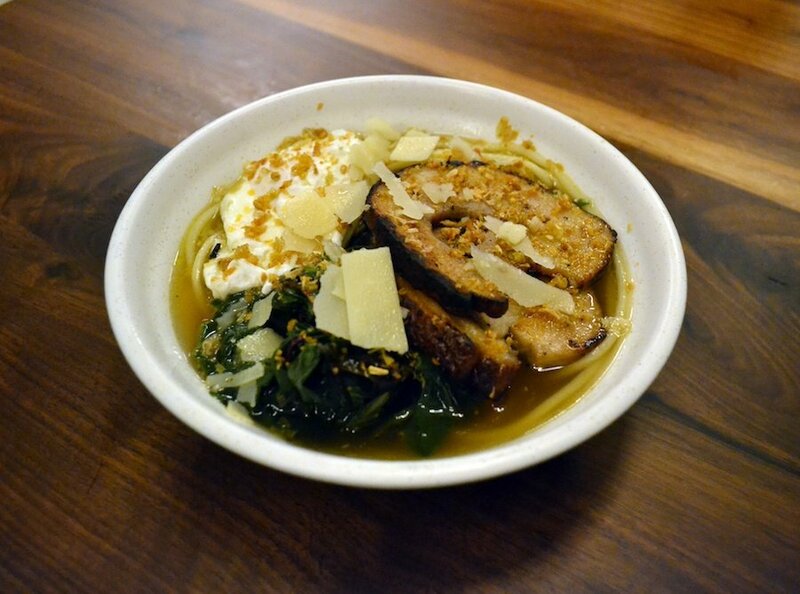 Hollow, house-made bucatini replace traditional Udon ramen noodles, floating in a sea of brodo or bone and meat broth. The soup is topped with grilled porchetta and charred Swiss chard that add heft and smoke. The Italian "ramen:" House made bucatini in brodo broth with porchetta, a poached farm egg, Swiss chard, crispy garlic, Calabrian chili oil and basil oil. As executive chef, he brings a mix of creative perspectives from his time as a chef in New York City and Savannah, Georgia. His subtle, Southern influence is palpable in several dishes. A small plate of pork belly and Brussels sprouts ($14) unites sweet and tangy flavors like apple cider and pickled pear. A bed of collard greens beneath the burnt honey lamb ribs ($32) cuts the layer of fat that tops the tender meat, first cooked in duck fat and allowed to harden prior to grilling. Each bite of lamb falls off the bone in crispy, buttery, morsels that melt into sweetness from the honey glaze and pear that’s whipped into the accompanying celery root puree. 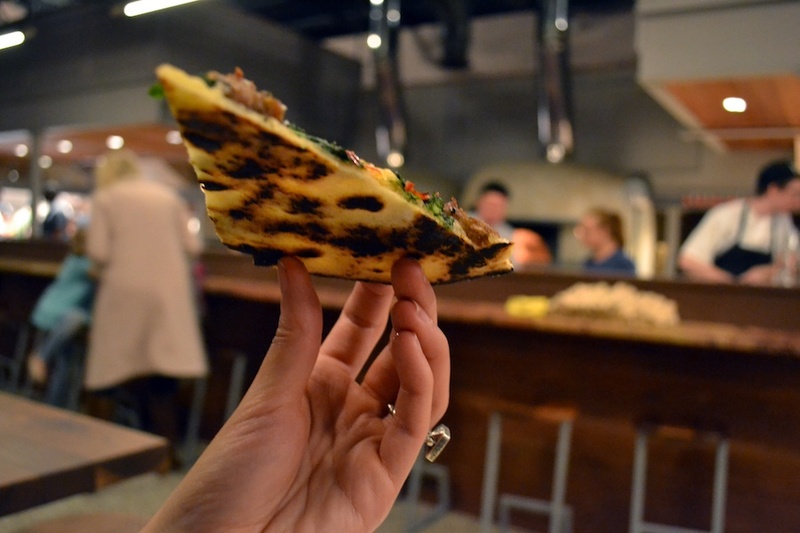 Nolo’s pizza menu nods to Da Legna’s bold topping combinations, but brings new flavors and texture with Parillo’s take on Roman-style thin crust pies made from organic flours. 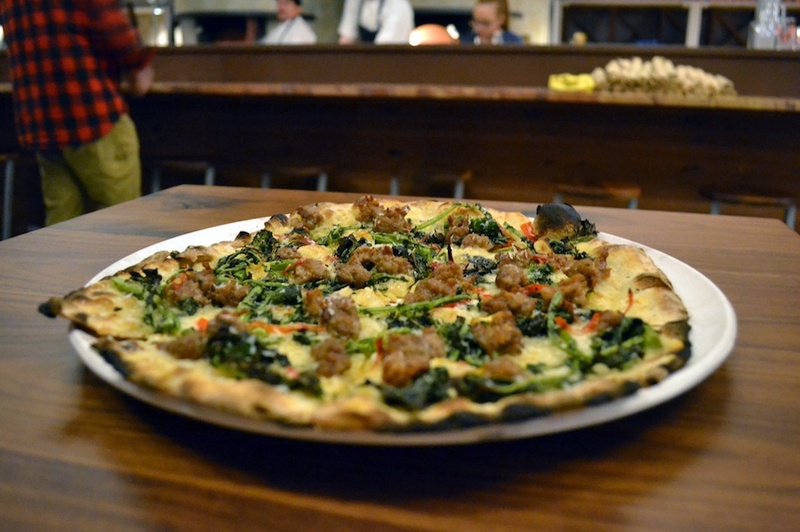 While dinner reservations end at 11:00 p.m., Nolo will serve pizza and small bites until close at 1 and 2 a.m.
At November’s soft opening, the “6 ate 7” white pizza came out perfectly charred in one of the restaurant’s massive wood-fire ovens, with a crust that held up a generous portion of sausage, broccoli rabe, Calabrian chili, Provolone and Parmigiano-Reggiano cheeses, with a touch of lemon. Slices are chewy yet crispy, and sturdy enough to eat with one hand—leaving the other free for one of Erector’s funky brews, like tangy-sweet Moist Greens, an India Pale Ale (IPA) made with Earl Grey and lemon. While Parillo, Bacon and Ulmer handle food, Nolo’s beer boss and master brewer is Erector Brewing Company’s Justin Maturo. His presence ensures that the restaurant will have several craft beers that can’t be found in cans or other locations. While Maturo will continue producing local favorites like the American Flyer Electric IPA and Home Slice Lager at East Haven’s The Beeracks, he also plans to make experimental batches at Nolo with input from Ulmer, and is aiming to keep taps open for collaborations with other breweries. Both Maturo and Ulmer mentioned ambitious brunch plans for Nolo, with Maturo most excited for beer and food pairings. One includes a beer-and-croissant flight that pairs a chocolate croissant with a stout, peach or fruit croissant with a sour, and a cheese croissant with a lager. For him, it’s also a chance to play a role in expanding the city’s beer scene. And one that the co-owners are excited for. In keeping with a local mission, Nolo has also commissioned several artists to enliven the restaurant with permanent work. In the dining room, there’s a freight train mural by Branford-based Marc Potocsky. 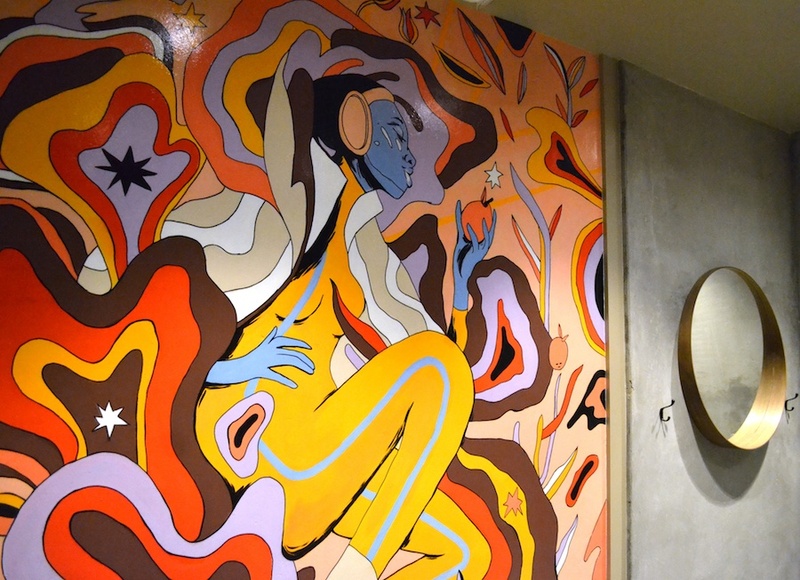 Another psychedelic design by Amanda Valaitis is featured in the women’s restroom. “This place—it’s art on its own,” Maturo said. 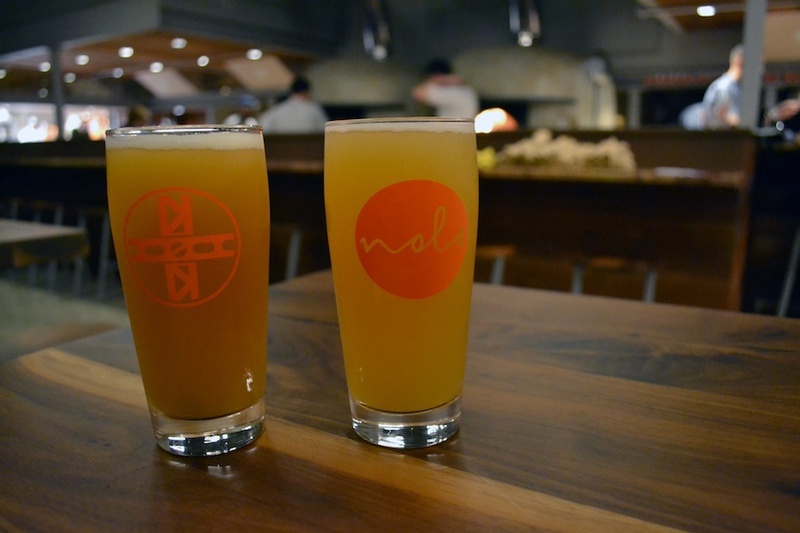 Nolo is slated to open later this month. Hours are Sundays from 9 a.m. to 1 a.m. and Mondays through Thursdays from 9 a.m. through 1 a.m., and Fridays and Saturdays from 11 a.m. through 2 a.m.